In envisioning the new campus, ISKL sought to create an environment that supports creative, collaborative, and constructive learning from prep-reception all the way through Grade 12. Above, ISKL’s spectacular new main entrance. Below, a glimpse of its sprawling pools and sports fields, and a bird’s-eye view of its impressive Epsom science commons (photos: ISKL). Most of us work in schools that have been adapted or adjusted in some way to align with changes to the way we teach and students learn. We dream of how our learning spaces could be. We get classroom envy when we see newer schools. Then we do what all educators are good at: making the most of what we have. It is not often that a school has the chance to reimagine, rethink, and physically rebuild itself—the educational equivalent of winning the lottery. 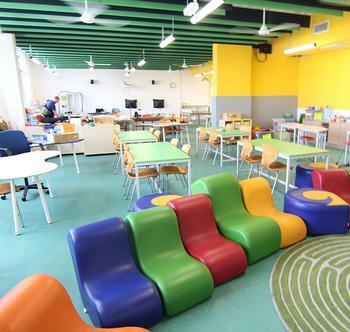 Designing its learning environment from the ground up is quite possibly one of the most invigorating and thought-provoking opportunities a school can experience. This chance of a lifetime was one we were fortunate to experience recently at the International School of Kuala Lumpur (ISKL). Established in 1965, we are one of Malaysia’s oldest schools and continuous growth had seen our school expand into two geographically separate campuses. With enrollment increasing, it was clear that we needed a space that would both reunite us and better support 21st-century learning. After an extensive search, the right location was found. Construction began in 2016 and we moved onto our brand-new campus in August 2018. If you were to rewind time three years, you would find us in the midst of working out how to reshape the learning environment for our 1,600+ students. Armed with examples of global best practice and reams of research, we brought together a team of international education architects, technology experts, and, of course, students, parents, and faculty to help us debate, plan, and design a new campus. Together we distilled the essence of what we wanted to achieve: an environment that supports creative, collaborative, and constructive learning from prep-reception all the way through Grade 12. Fast forward to today and the manifestation of this objective is evident in the schoolwide collaborative areas, makerspaces, and common spaces related to specific areas of study. All have been purposefully designed to provide flexibility, inspire ideas, and allow opportunities for interaction and connectivity—concepts that are integral to our inquiry-based curriculum. However, I want to reflect, not on what we as a school have achieved, but on what our students are achieving as a result of purposeful design. Elementary school interactive lessons in our makerspaces enable students to put thinking into action and experience real-world problem solving. Skills learned in mathematics are put into practice in the makerspace when designing and measuring a model building or in the study of weather patterns brought to life by creating rain gauges from recycled water bottles. These are invaluable learning experiences, and we have found truly inspirational the creativity and maturity of ideas from our youngest students when they experience hands-on learning that is integrated into the curriculum. Likewise, outcomes from the middle school’s design technology lab—named an “Inventors’ Playground” to capture the essence of the growth mindset—show the effectiveness of interdisciplinary learning in developing thinking strategies and teaching students to analyze information, synthesize input, and meaningfully reflect on their learning. The purposefully designed common spaces for each division include separate common areas for specific subjects with the goal of facilitating learning and interaction outside the classroom. These ensure that students and faculty are supported, no matter how they prefer to research, work, and learn. Such spaces are particularly valued by our high school students, as they support project-based inquiry and collaborative learning, which in turn build vital skill sets needed for success at university and in the workplace. Ultimately, our role as educators is to provide students with an environment that supports and stimulates their creativity, innovation, and learning. At ISKL, we have been lucky enough to channel our own creativity, innovation, and learning into creating just such an environment. As we complete the end of our first semester at our new campus, we are enormously appreciative of this opportunity and are inspired by the student learning outcomes that have resulted from purposefully designed collaborative spaces. Norma Hudson is in her sixth year as the Head of School at The International School of Kuala Lumpur, Malaysia. Since Dr. Hudson assumed leadership of ISKL in 2013, the funding, design, development, and transition to a new purpose-built campus has been a key priority. It opened in August 2018. They are doing something similar at Head Start in Japan. I have been hired there via www.seriousteachers.com site.